Figure: Design and operation of the acoustofluidic rotational manipulation (ARM) device. (a) A schematic of the experimental setup. The piezoelectric transducer that generates acoustic waves is placed adjacent to the microfluidic channel. The acoustic waves actuate air microbubbles trapped within sidewall microcavities. (b) An optical image showing a mid-L4 stage C. elegans trapped by multiple oscillating microbubbles. Scale bar, 100 microns. The precise rotational manipulation of single cells or organisms is invaluable to many applications in biology, chemistry, physics and medicine. In this article, we describe an acoustic-based, on-chip manipulation method that can rotate single microparticles, cells and organisms. To achieve this, we trapped microbubbles within predefined sidewall microcavities inside a microchannel. 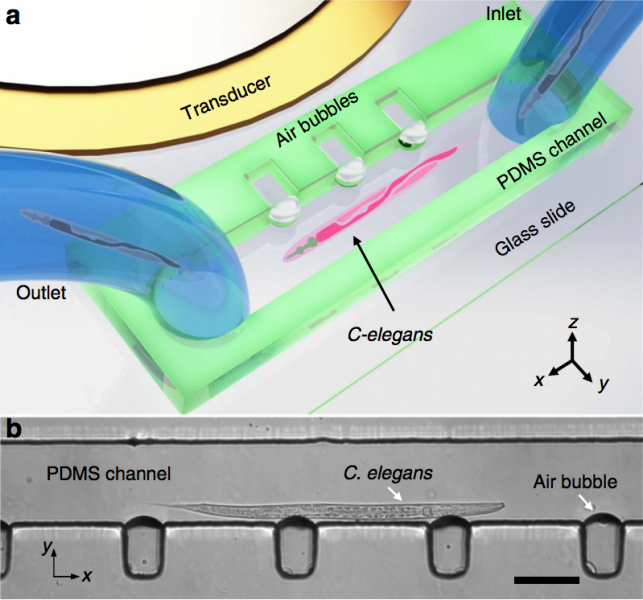 In an acoustic field, trapped microbubbles were driven into oscillatory motion generating steady microvortices which were utilized to precisely rotate colloids, cells and entire organisms (that is, C. elegans). We have tested the capabilities of our method by analysing reproductive system pathologies and nervous system morphology in C. elegans. Using our device, we revealed the underlying abnormal cell fusion causing defective vulval morphology in mutant worms. Our acoustofluidic rotational manipulation (ARM) technique is an easy-to-use, compact, and biocompatible method, permitting rotation regardless of optical, magnetic or electrical properties of the sample under investigation. Figure: Bubble-based switching between multiple stimuli. (a) Schematic of the experimental setup for chemical switching. 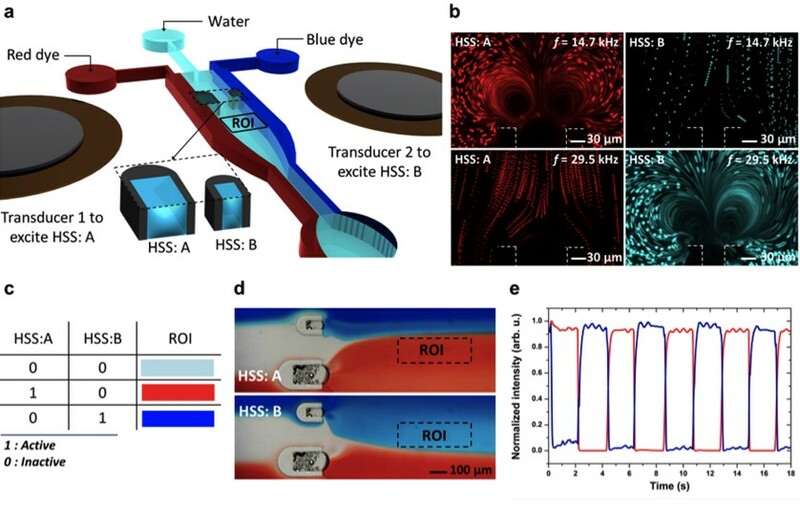 The microfluidic channel contains HSSs of different sizes and, subsequently, bubbles of different sizes that are independently driven by transducers bonded to the substrate adjacent to the channel. (b) Top, visualization of microstreaming from the bubble trapped in HSS A (red) while no streaming is observed in the bubble trapped in HSS B (blue) at an excitation frequency of 14.7 kHz. Bottom, visualization of the microstreaming from the bubble trapped in HSS B while no streaming occurs in HSS A at an excitation frequency of 29.5 kHz. (c) Table showing the concept of binary logic circuitry. (d) Results demonstrating switching between the blue and red dyes. (e) Graph of experimental data for switching between red and blue dyes in the selected ROI marked in panel d.
Eliciting a cellular response to a changing chemical microenvironment is central to many biological processes including gene expression, cell migration, differentiation, apoptosis, and intercellular signaling. The nature and scope of the response is highly dependent upon the spatiotemporal characteristics of the stimulus. To date, studies that investigate this phenomenon have been limited to digital (or step) chemical stimulation with little control over the temporal counterparts. Here, we demonstrate an acoustofluidic (i.e., fusion of acoustics and microfluidics) approach for generating programmable chemical waveforms that permits continuous modulation of the signal characteristics including the amplitude (i.e., sample concentration), shape, frequency, and duty cycle, with frequencies reaching up to 30 Hz. Furthermore, we show fast switching between multiple distinct stimuli, wherein the waveform of each stimulus is independently controlled. Using our device, we characterized the frequency-dependent activation and internalization of the β2-adrenergic receptor (β2-AR), a prototypic G-protein coupled receptor (GPCR), using epinephrine. The acoustofluidic-based programmable chemical waveform generation and switching method presented herein is expected to be a powerful tool for the investigation and characterization of the kinetics and other dynamic properties of many biological and biochemical processes.